Sometimes the most simple of recipes are the BEST recipes! Oh my gosh…I had no idea just how much I would love this dish. 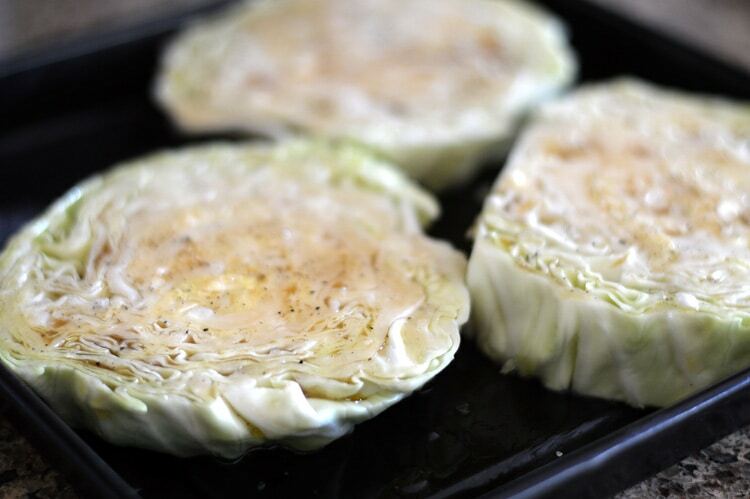 I had seen Roasted Cabbage Steaks on Pinterest and really wanted to try making them. The whole head of cabbage is cut into one inch “steaks” and dressed with a mixture of olive oil, balsamic, agave nectar, salt and pepper. It’s this dressing that allows for the caramelization process that will occur during roasting. You could enjoy the roasted cabbage as is. What really makes this dish amazing however, is the tangy vinegar-based mustard dipping sauce. If you’ve followed me for awhile now, you may have seen me use this sauce in my St. Patrick’s day recipes (I’ll include a few links at the bottom of this recipe). When I think cabbage, my mind automatically goes back to this sauce. It comes from a recipe my grandmother handed down to my mom. I have been using it ever since. 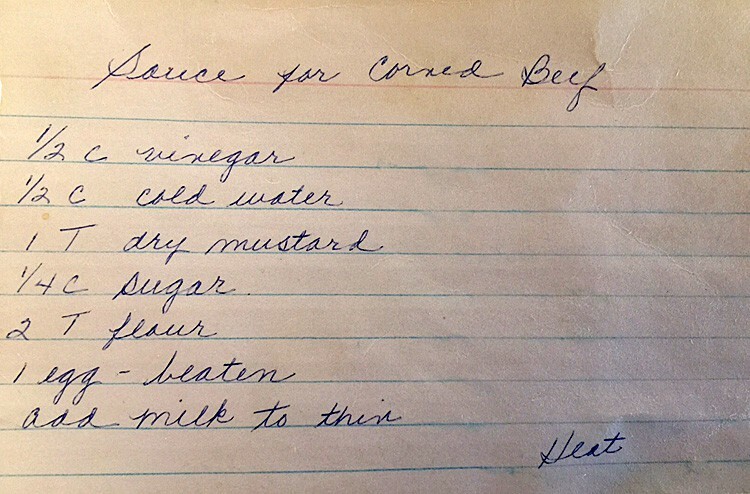 Since it was handwritten, we really don’t know where it originated, but in my family…it was made only on St. Patrick’s Day. 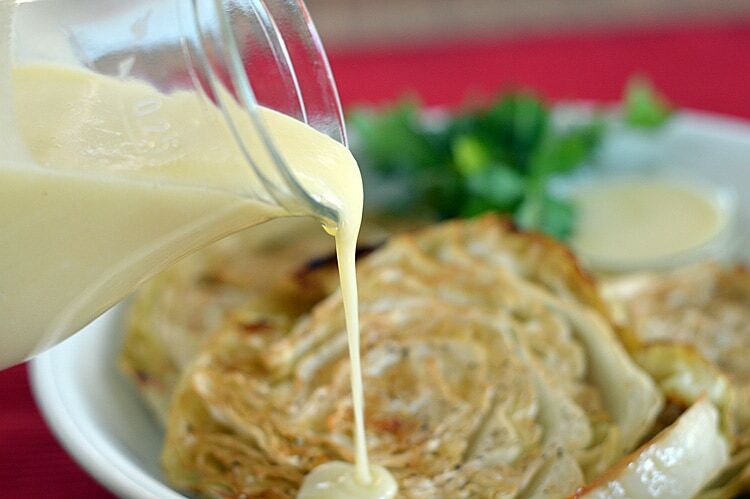 This sauce is a match made in heaven with cabbage! I’ve obviously veganized it a bit since the original called for an egg. The first step is to slice the cabbage into steaks and I know that may seem daunting, but leaving the core intact really aids in slicing. I first trim the core end so I have a stable surface area. Then, I start making vertical slices about one inch thick. I got about four intact slices from one medium cabbage. Lightly brush the baking pan with oil to prevent sticking. I’m once again using my favorite Breville Mini Smart Oven. I just love this thing! I combine all of the dressing ingredients and evenly distribute among the slices. While the cabbage is roasting, I place all of the ingredients for the sauce into a small pan. As I mentioned, the only significant change to the original recipe was to replace the egg with something else. I’ve tried a few things, including silken tofu in the previous recipes. Now I just omit it all together. 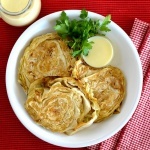 The flour does a great job at thickening the sauce and the mustard powder gives it that nice pale yellow color. 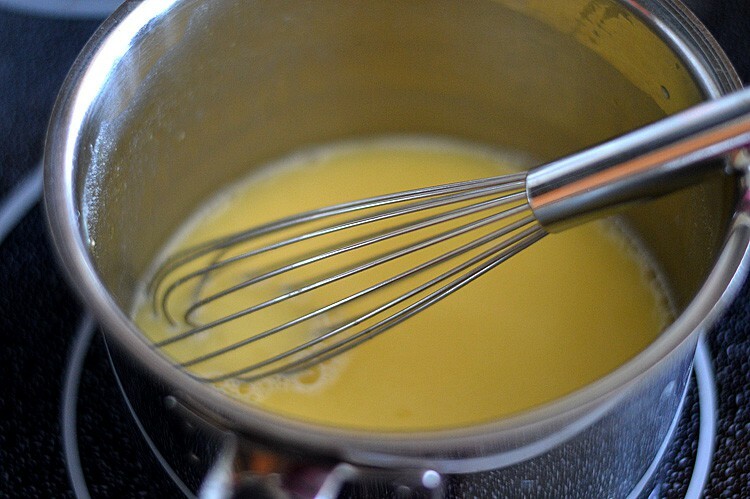 I simply whisk over medium heat until everything comes together and it begins to thicken slightly. You can always thin using more almond milk. 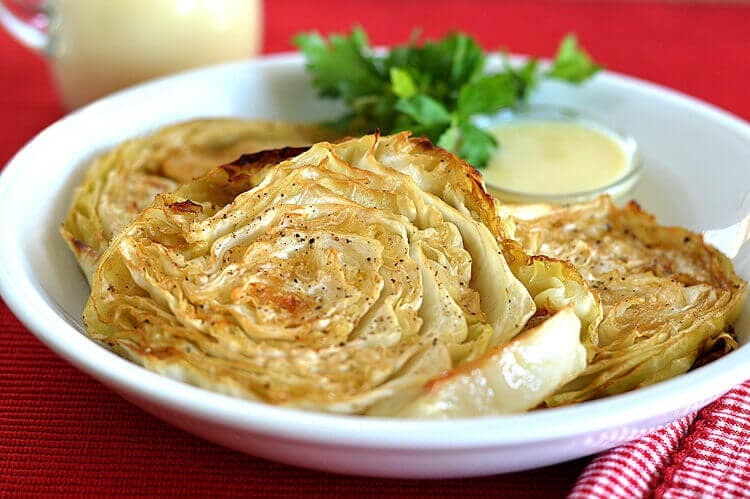 Once the cabbage steaks are fork tender and the edges are golden and caramelized, carefully remove with a large spatula to a serving plate. The cabbage will still hold together, but the edges will be more fragile now that it has cooked. Be sure to capture all of those pan juices as well. Season with salt and pepper and of course, a generous drizzle of that mustard sauce. I like to serve a small bowl of it with each plate so everyone has their own. I place the remaining sauce into a small pitcher in case anyone wants more. And they will. It’s soooo good! Brush baking sheet with a very small amount of oil just to prevent sticking. Trim just enough of the bottom of a medium cabbage to sit flat on your cutting board and peel off any unsightly leaves. Position the cabbage on it's now trimmed core, slice the cabbage into 1" steaks. Place onto the greased baking sheet. Evenly distribute the dressing among the steaks and roast for approximately 30 minutes or until fork tender with golden caramelized edges. In the last few minutes before the cabbage is done, combine all of the ingredients for the sauce in a small pan over medium heat, whisking to combine. The sauce will thicken as it cooks much like a gravy would. If it gets too thick, just add more almond milk and whisk to incorporate. Season the steaks with additional salt and pepper. 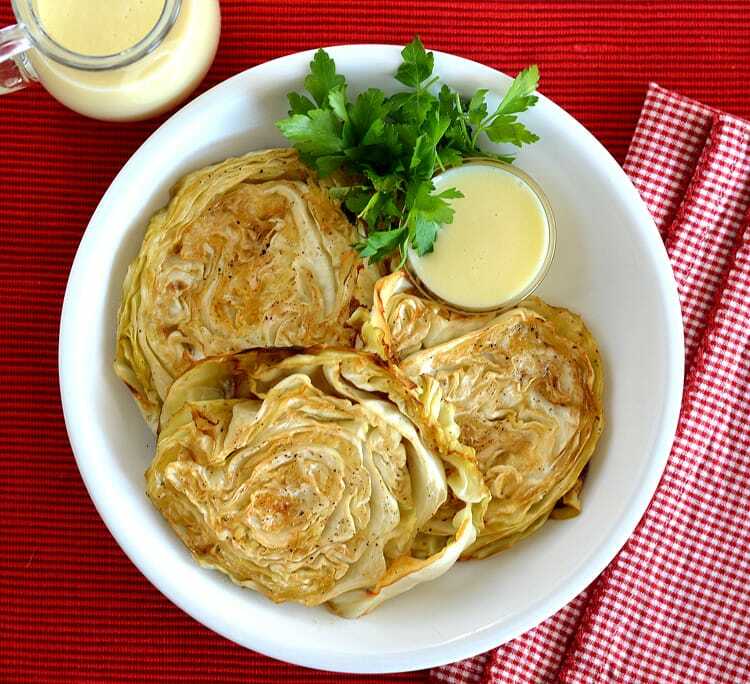 Serve with the warm mustard sauce. these were delicious. I made them with maple syrup and didn’t do the mustard dip b/c I served it with fennel sausage. SO GOOD. Thanks for the recipe.